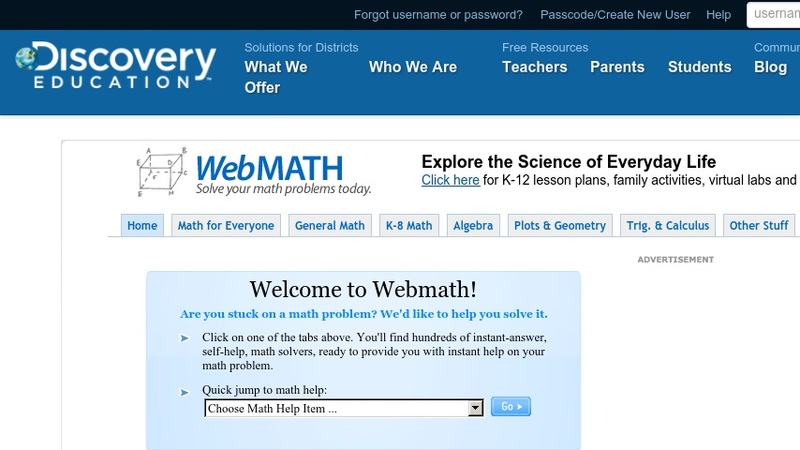 This website demonstrates various math concepts and problems. The topics are organized by topic, such as math for everyone, general math, K-8 math, algebra, plots & geometry, and trigonometry & calculus. Each demonstration has an interactive format so that visitors can see the solution to a particular problem and then read the explanation for the problem solution. The website also has a few advertisements and offers for other products. Another resource offered is the option to ask an expert about a particular problem. It is free to submit the question, but costs money "if a solution becomes available." However, over 1,000 previously answered questions are posted online and most can be viewed free of charge.